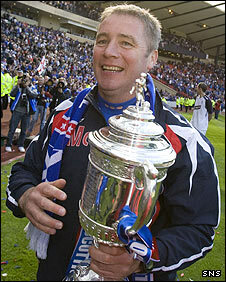 Scottish Cup holders Rangers will meet St Mirren in the semi-finals of this season's tournament. The other tie will see the SPL's bottom club Falkirk meet either Aberdeen or Dunfermline, who face a replay at Pittodrie on 17 March. If St Mirren are to reach their first final since winning the cup in 1987, they will have to complete an Old Firm double, having already defeated Celtic. The semi-finals will be played on the weekend of 25/26 April. Falkirk, who won the cup in 1913 and 1957, have reached the semi-finals of both major domestic cups in the same season for the first time in their history. And the Bairns will want to make up for their poor showing at Hampden in January, when they lost out 3-0 to Rangers in the last four of the Co-operative Insurance Cup. "We didn't do ourselves justice against Rangers the last time, so I'm glad we avoided them this time," Falkirk manager John Hughes told BBC Scotland, before adding that he wanted the tie to be played at Hampden. First Division Dunfermline, beaten finalists in 2004 and 2007, hit a late equaliser at home to Aberdeen to earn a replay. However, the Dons have not lost any cup clash at home since Rangers beat them 2-0 in 2004, shortly after manager Jimmy Calderwood took over. Rangers won both domestic cups last season, beating Queen of the South in the term's finale, while edging out Dundee United on penalties in the League Cup. However, Ibrox assistant manager Ally McCoist is expecting a tough match against a St Mirren side buoyed by Saturday's 1-0 triumph over Celtic. "It's a smashing draw for the plain and simple reason that we're there," he told BBC Scotland. "I couldn't care who we got because I just wanted to be in that semi-final. It's a very tough game for us, you just have to look at the Celtic result. "I think St Mirren really are an improved side. Gus MacPherson and Andy Millen have got them playing really well. "Craig Dargo and Billy Mehmet up front are a real handful and they look solid at the back. And, of course, they have already beaten us this year. "There is no way we'll be underestimating the task." St Mirren managed a 1-0 league win over Rangers at Love Street in early October and manager MacPherson was in an upbeat mood. "At this stage it doesn't really matter who you are up against," he told BBC Scotland. "The SPL is so competitive this season that anybody thinks they have a chance to beat the Old Firm over 90 minutes. "We've had a few heavy defeats from Rangers and Celtic as well but we'll go into the match in a positive frame of mind."